JDR -BE's primary focus is providing JDR-BE Brazilian Embroidery Design. The JDR-BE Designs are at the highest wholesale discount. 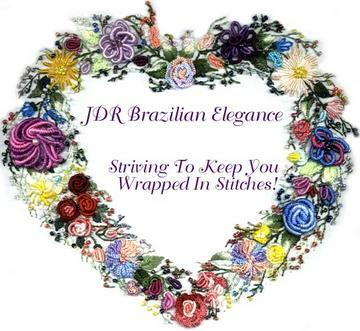 JDR Brazilian Elegance sells to shops and retail stores around the world. We will give you some suggestions as to what may be a good starting point for you. JDR Brazilian Elegance is the distributor for all JDR-BE designs and kits, EdMar threads and patterns, Blackberry Lane and many other Designers. 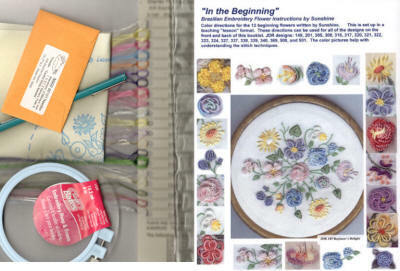 We have all the Brazilian Embroidery Books you should need plus " lots " of other embroidery books also. The " JDR " books (JDR Brazilian Embroidery by Ria Ferrell, Sunshine's Treasures and Leaves by Cheryl Schuler) are at the highest discount. We purchase in bulk, so many of our Notions prices are reasonable. We do wholesale or discount most items listed on our site to our wholesale customers. Not everything is sold at a full wholesale discount. We sell " Ones " and " Twos " to small shops. We have no minimum requirements. If you are have a question about any particular price - please call. Our turn around time is usually 48 hours or less of JDR designs and books. Resale Form To Fax, Mail, or jpeg email to JDR-BE. Wholesale Pricing Information You will need a password. Fill out the Resale form and other information required. You will be able to save a copy to your desktop in a PDF format (Adobe Acrobat). MUST HAVE THE PASSWORD. It has all of the Suggested Retail Prices and the Costs for Discounted Purchases. YOU MUST CALL OR E-MAIL FOR YOUR PASSWORD. We must have an up to date resale form on file. We provide a free retail copy here for YOU to print off. Place the number of items you want in the square and press the add button. call 701-874-2430 OR E-mail us your order and we will e-mail you a " Pending Invoice " so that you will see your exact costs. To get the discounted prices we must have a current Resale Form on file along with the information requested.